South Africa’s Jacob Zuma, president until Wednesday when he resigned on live TV, faces an uncertain future as his legal challenges mount and his support network crumbles. Analysts sketch several scenarios for Zuma, an anti-apartheid activist who rose to the presidency only to become thickly tarred by a reputation for graft. These include prosecution over a series of corruption charges and then securing a presidential clemency from his successor Cyril Ramaphosa. He may also quietly disappear into retirement in his home province of Kwa-Zulu Natal — or even skip the country, according to these narratives. 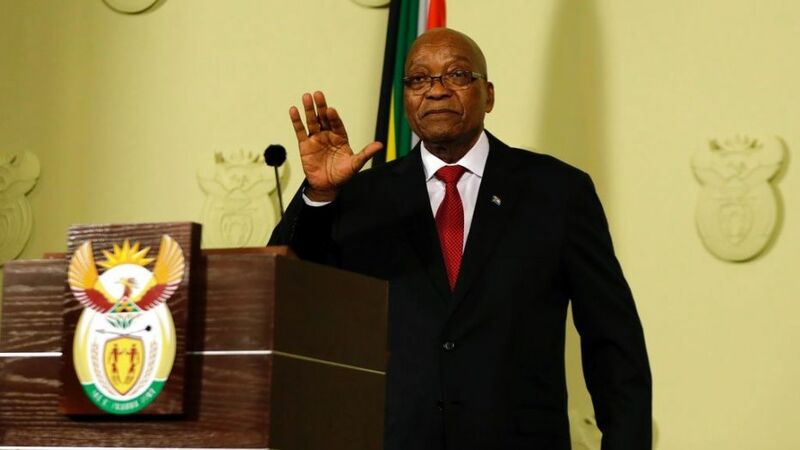 Zuma faces 18 criminal charges over 783 payments he received linked to a multi-billion rand 1990s arms deal, and the clamour for him to face justice has been growing in recent months. The charges were set aside just weeks before he became president in 2009. It will now be down to the National Director of Prosecutions to decide whether to reinstate them. Zuma may also face charges over state corruption arising from his links to a controversial Indian business family, the Guptas. “We are looking at a very awkward, troublesome and uncertain period for Zuma as he defends himself on all these fronts,” commentor Daniel Silke said. If convicted, Zuma could face decades in jail. Zuma previously spent 10 years in jail on the notorious Robben Island between 1963 and 1973 after being convicted by the apartheid regime of conspiring to overthrow the government. If Zuma is prosecuted and convicted, the next question is whether Ramaphosa would intervene to pardon the erstwhile president. On one hand, Zuma was a celebrated anti-apartheid struggle figure who was close to Nelson Mandela and still has huge support — especially in the ANC’s rural heartlands. On the other, a pardon could taint Ramaphosa’s clean-hands image and give the opposition a stick with which to beat the ANC. General elections are due in 2019. “Nobody is above the law, even if you are the president. There is no immunity,” said constitutional law expert Pierre de Vos. But as sitting president, Ramaphosa “can pardon anyone who has been convicted of a crime,” he said. In that case it is most likely that he would retreat to his rural Nkandla farmstead in rural Kwa-Zulu Natal in the country’s east.